Junior Minister in the Ministry of Communication, Works and Public Utilities on Nevis, the Hon. Troy Liburd has refuted statements made by Opposition Leader the Rt. Hon. Dr. Denzil Douglas concerning a proposed US$14M loan to the Nevis Island Administration (NIA) from the St. Kitts-Nevis-Anguilla National Bank. Speaking recently on a local talk show, Dr. Douglas repeated comments he had earlier made on the Land for Debt Swap issue and alleged that the National Bank is being undermined by the Team Unity Administration. He made reference to the 2014 fiscal year, stating that the NIA had made it absolutely clear that its debt to the National Bank was approximately $138M in loans and an overdraft. Douglas said during that time an attempt was made by the NIA to obtain $29M from the bank in an agreement to reduce its debt by way of exchange of lands. “We know that there has been difficulty on the part of the NIA to continue the agreement that was signed. And so everyone thought that eventually in order for the NIA to obtain money to meet its obligations to services to its citizens and others, it would eventually settle the matter by finding the lands. 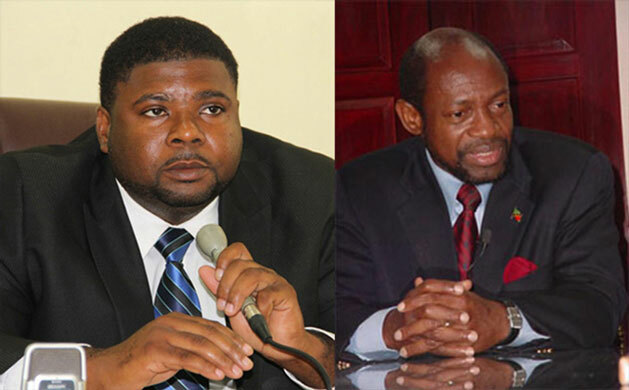 “And so when we went into Parliament in March and there was a resolution that was brought by the Minister of Finance, the deceptive Minister of Finance Timothy Harris, to advance the guarantee of about $140M to the NIA, we thought that here was an opportunity for the Nevis Island Administration to come good on its promise on the Land for Debt initiative,” Dr. Douglas explained. However, contrary to that belief, the Opposition Leader said the bank’s Directors had advanced another loan of $140M to the NIA for 30 years at an interest rate of three percent. Dr. Douglas claimed that the bank would lose $40M in the transaction. While as a panellist on Winn FM’s ‘Inside the News’ programme last Saturday (May 14), Minister Liburd took the opportunity to respond to the Opposition Leader’s comments. He declared that the NIA was not in receipt of any loan at a three-percent interest rate, but confirmed that an application was indeed made for US$140M. He asserted that the overdraft was not made by the CCM Administration, noting that it was something his party met when it took office in 2013, while offering an explanation. “These are debts that were there before. And how did these debts get on the books…most of them? When the previous CCM Government left office in 2006 they had an overdraft of twenty-eight point something million dollars with the National Bank. That’s on their working account that they would use to do their day-to-day business for the people of Nevis. That overdraft ballooned under the NRP Government up to 70-plus million. I think it was seventy-four point something million, at its highest. The Junior Minister pointed out that between April 2009 and December 2012 while the Nevis Reformation Party was in office, the overdraft that was near zero had increased to $60M. He opined that there had to be some enabling for it to have reach that amount. Liburd reiterated that those were loans and an overdraft already on the books and that the NIA is now trying to get some relief so that it could continue to better function in order to serve the people of Nevis. “So we are simply looking to consolidate those loans. I know that what is being discussed is at a rate of somewhere around five percent. But I want to say that I think three percent is more than fair on the scale of loan that we are talking about. Because, one would remember not too long ago, we had something in the Federation called a Land for Debt Swap…I think they were looking for something like a billion dollars. I don’t know what the exact figure was that was transferred, but that is information that is there and we can look into it. “But the bank held a lot of loans for the Federal Government and then the Administration led by Dr. Douglas decided that…he came up with something called Land for Debt Swap where he will take the debt off the books of the government and in turn swap for some lands with the National Bank. I think the lands were swapped at a really high rate. I know that they got 3.5% and you didn’t hear anybody from Nevis go out and cry foul and say, ‘Oh, the Federal Government is getting a sweet deal at 3.5%’,” Liburd explained. The Communications Minister asserted that wool was pulled over the people’s eyes when the Land for Debt Swap arrangement was done, because the nation was told that the debt was gone. Minister Liburd is of the view that the arrangement being made between the NIA and National Bank would definitely be easier on the financial institution because they are taking a loan and would be paying back interest and premium. “He took all of the debt that was there that he ran up. Look at the difference…it is not debt that the CCM ran up. It is NIA’s debt and we have to take it because we are NIA now. What if the lands are not sold? That is a dead asset that the bank has there!” Liburd intoned.